Arguably the ultimate American destination for families looking for fun, Anaheim is the place where the successful Disneyland business model began its life, way back in the 1950s. Today, the city draws endless theme park seeking crowds of tourists, thanks in no small part to its convenient location within reach of the sprawling Los Angeles metropolitan area. There are two parks that comprise the Disney complex here - the Disneyland Park and Disney's California Adventure. If you are intending to properly explore both parks and their rides during your Anaheim vacation, then you should allow at least three days, since queues form quickly at the best attractions and rides during the busy summer months. However, multi-day passes are available, making it a little more affordable, although don't forget to factor in parking charges. 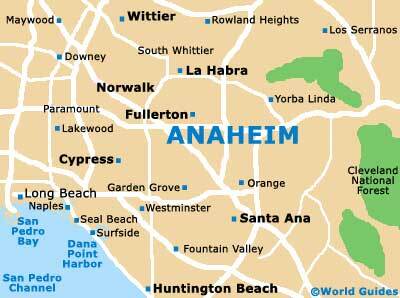 Holiday makers heading to this part of southern California may like to check out the following assorted Anaheim links. Anaheim / Orange County Visitor and Convention Bureau - 800 West Katella Avenue. Gaslamp Quarter Association - 614 5th Avenue. Knott's Berry Farm - 8039 Beach Boulevard, Buena Park. Knott's Soak City Water Park Orange County - 8039 Beach Boulevard, Buena Park. Disneyland Resort / California Adventure - 1313 Disneyland Drive. Adventure City - 1238 South Beach Boulevard. Anaheim Plaza Hotel and Suites - 1700 South Harbor Boulevard. Holiday Inn Hotel and Suites Anaheim - 1240 South Walnut Street. Howard Johnson Plaza Hotel - by Disneyland Park - 1380 South Harbor Boulevard. Best Western Plus Park Place Inn and Mini Suites - 1544 South Harbor Boulevard. Ramada Maingate at the Park - 1650 South Harbor Boulevard. Desert Palms Hotel and Suites - 631 West Katella Avenue. Sheraton Park Hotel at the Anaheim Resort - 1855 South Harbor Boulevard. Castle Inn and Suites - 1734 South Harbor Boulevard. Anaheim Quality Inn and Suites - 1441 South Manchester Avenue. The Anabella - 1030 West Katella Avenue. Holiday Inn Anaheim Resort Area - 1915 South Manchester Avenue. Hotel Pepper Tree - 2375 West Lincoln Avenue. Islander Inn and Suites - 424 West Katella Avenue. America's Best Value Inn and Suites - Disneyland Resort - 425 West Katella Avenue. Ramada Plaza Anaheim Hotel - 515 West Katella Avenue. Lemon Tree Hotel - 1600 East Lincoln Avenue. Comfort Inn and Suites - 300 East Katella Avenue. Residence Inn by Marriott - Anaheim Resort Area Hotel - 11931 Harbor Boulevard, Garden Grove (nearby). Anaheim Marriott Suites - 12015 Harbor Boulevard, Garden Grove (nearby). Fullerton Municipal Airport - 4011 West Commonwealth Avenue, Fullerton. Ontario International Airport - 1923 East Avion Drive, Ontario. Cable Airport - 1749 West 13th Street, Upland. El Monte Airport - 4233 North Santa Anita Avenue, El Monte. Bob Hope Airport - 2627 North Hollywood Way, Burbank. Torrance Airport - Zamperini Field - 3301 Airport Drive, Torrance. Long Beach Airport - 4100 Donald Douglas Drive, Long Beach. Anaheim Resort Transit - 1280 Anaheim Boulevard. EZ Rent a Car - 1646 Clementine Street. Southern California Gray Line - 2001 South Manchester Avenue. YellowCab of Greater Orange County - 1619 East Lincoln Avenue. American VIP Transportation - 100 West Disney Way. Diamond Anaheim Limos - 675 North Euclid Street. Transtar Shuttle and Sedan Service - 541 North Crescent Way.